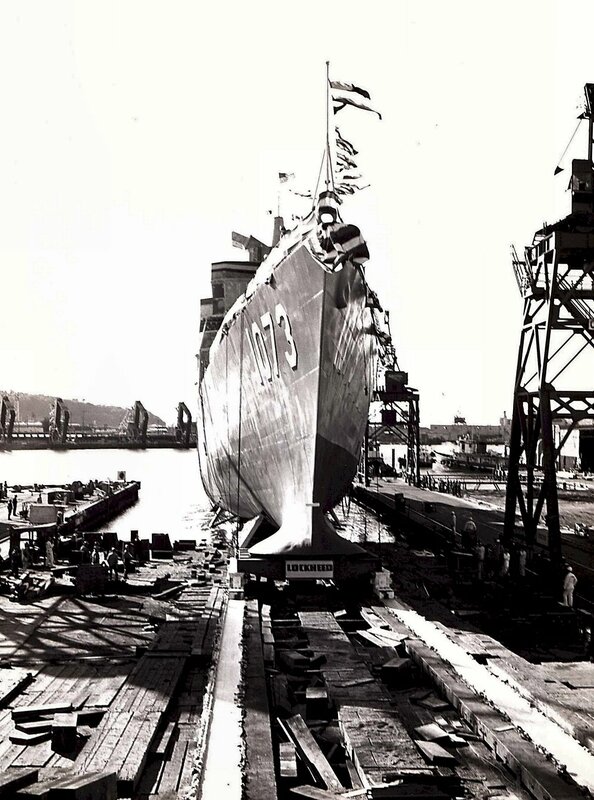 22 July 1964: Building contract awarded to the Lockheed Corp.
23 September 1972: Commissioned, Cmdr. Charles Beasley in command, assigned to CruDesPac at Long Beach, Cal. 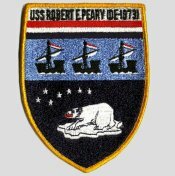 73k Robert Edwin Peary (06 May 1856 - 20 February 1920) was born in Cresson, Pennnsylvania near Pittsburgh, grew up in Maine, and graduated from Bowdoin College as a civil engineer in 1877. Peary made several expeditions to the Arctic, exploring Greenland by dog sled in 1886 and 1891 and returning to the island three times in the 1890s. Unlike many previous explorers, Peary studied Inuit survival techniques, built igloos, and dressed in practical furs in the native fashion. Peary also relied on the Inuit as hunters and dog-drivers on his expeditions, and pioneered the use of the system (which he called the "Peary system") of using support teams and supply caches for Arctic travel. His wife, Josephine, accompanied him on several of his expeditions. He also had 8 toes amputated but kept walking. 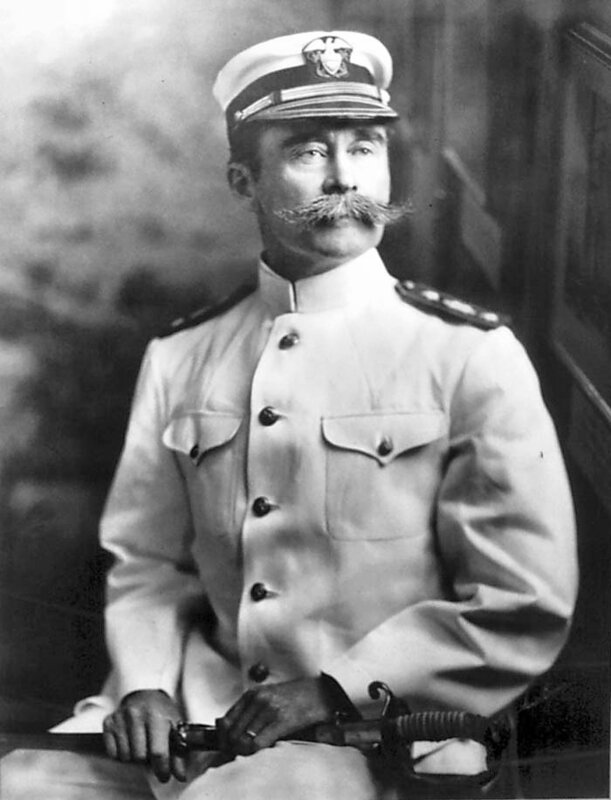 Peary made several attempts to reach the North Pole between 1898 and 1905. For his final assault on the pole, he and 23 men set off from New York City aboard the Roosevelt under the command of Captain Robert Bartlett on 6 July 1908. They wintered near Cape Sheridan on Ellesmere Island and from there departed for the pole on 1 March 1909. The last support party turned back on 01 April 1909 in latitude 87°47' north. On the final stage of the journey to the North Pole only five of his men, Matthew Henson, Ootah, Egigingwah, Seegloo and Ooqueah, remained. On 06 April, he established Camp Jesup near the pole. In his diary for 07 April (but actually written up much later when preparing his journals for publication), Peary wrote "The Pole at last! The prize of 3 centuries, my dream and ambition for 23 years. Mine at last..." He died in Washington DC on 20 February 1920 and was buried in Arlington National Cemetery. His gravesite is topped by a huge globe on which Peary's personal credo, "I shall find a way or make one," is inscribed. 446k 01 October 1981: San Francisco, Cal. 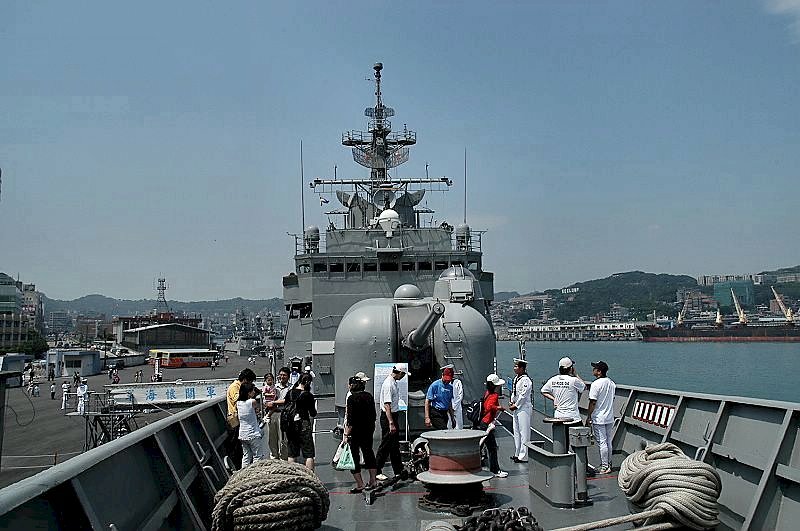 - A starboard beam view of Robert E. Peary underway during Fleet Week activities. Visible in the background are the San Francisco-Oakland Bay Bridge, and the San Francisco skyline. 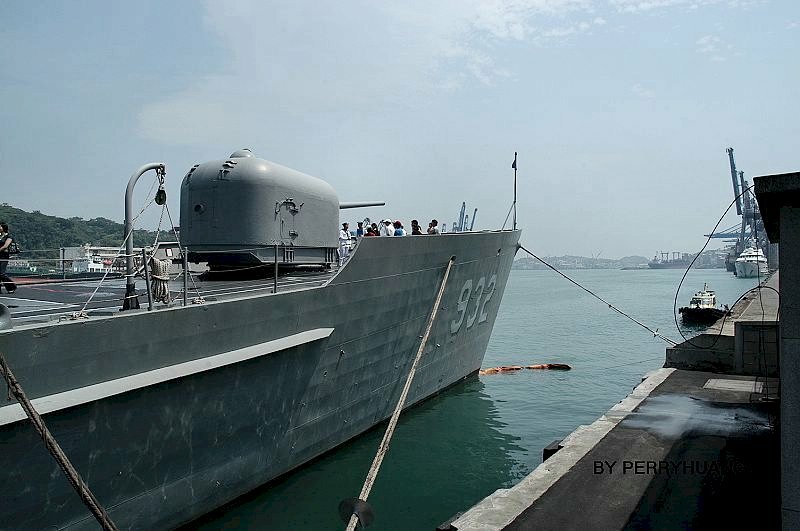 124k 01 January 1989: location unknown - The Brunei missile fast attack craft KDB Seteria (P-04) is moored at the pier at the missile fast attack craft KDB Pejuang (P-03) approaches. 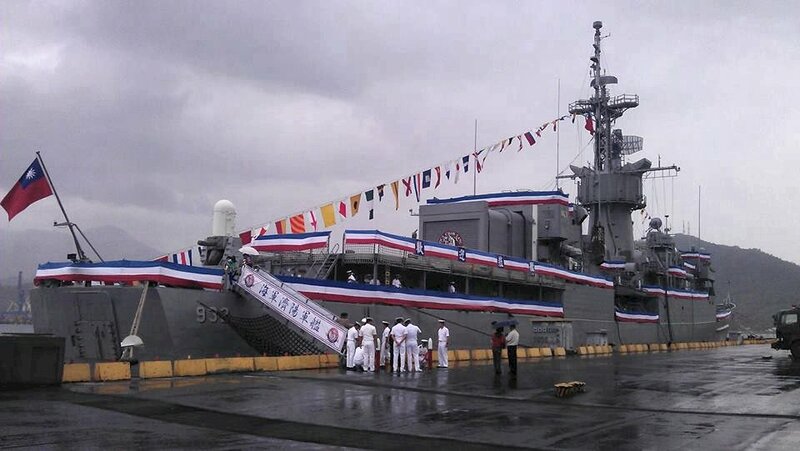 The American flag flies from the stern of Robert E. Peary in the foreground. 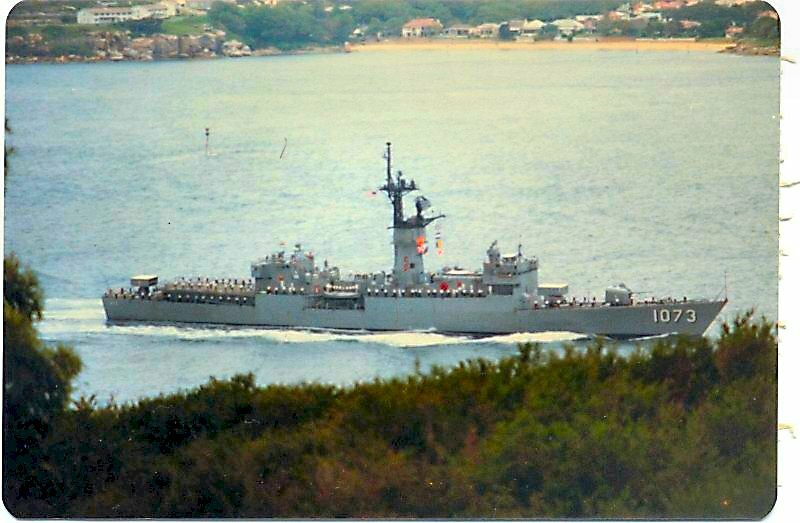 130k 04 June 1990: At sea - The Royal Australian Navy large patrol craft HMAS Townsville (205) and Robert E. Peary come into port for the joint naval exercise KANGAROO '89. 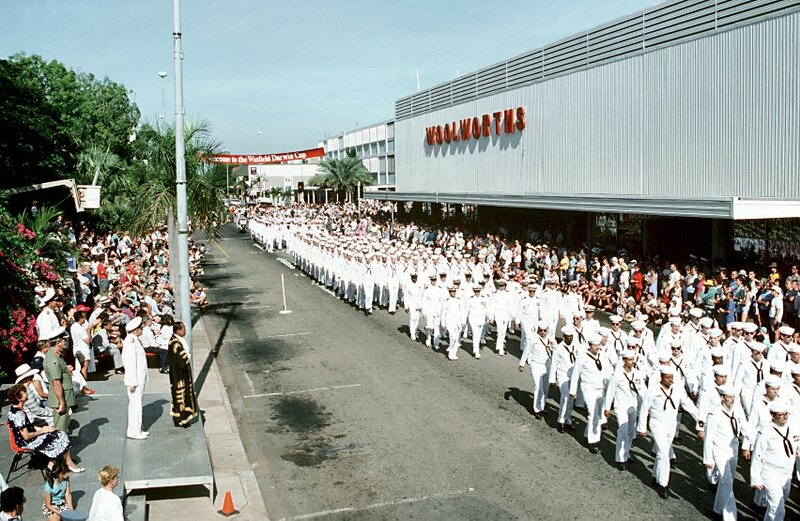 166k 04 June 1990: location unknown - Crew members from the destroyer USS Oldendorf (DD 972) and Robert E. Peary march in a parade along with their Royal Australian counterparts prior to the start of the joint exercise Kangaroo '89. 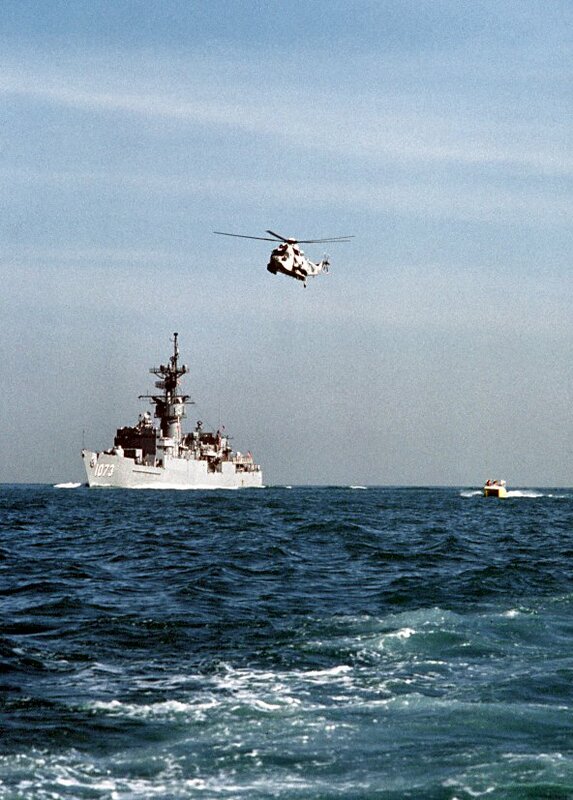 144k 29 October 1990: location unknown - An SH-3 Sea King helicopter flies near Robert E. Peary as the ship pulls into port prior to the joint military exercise KANGAROO '89. 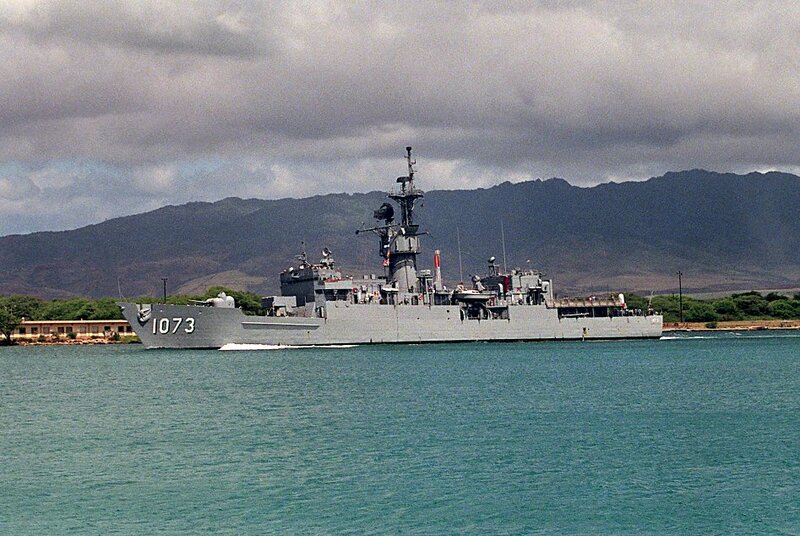 179k 01 June 1991: NavSta Pearl Harbor, Hi. 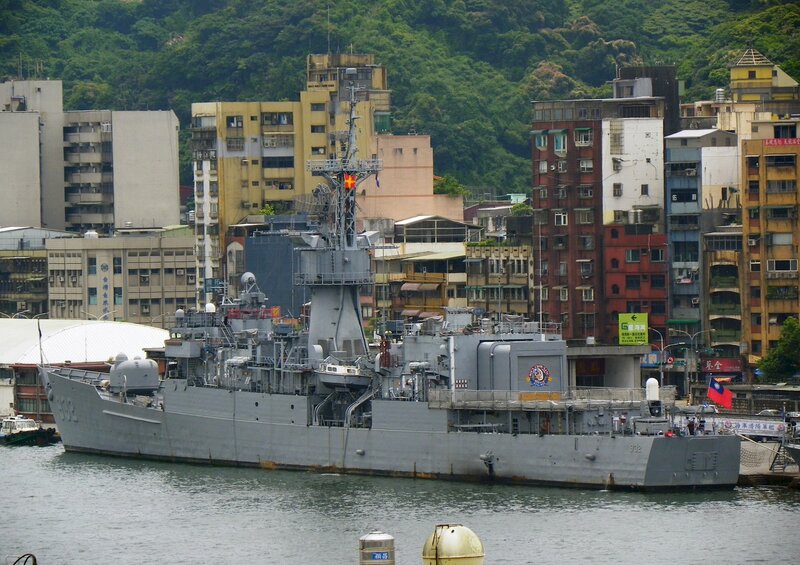 - A port view of Robert E. Peary departing Pearl Harbor through the channel. 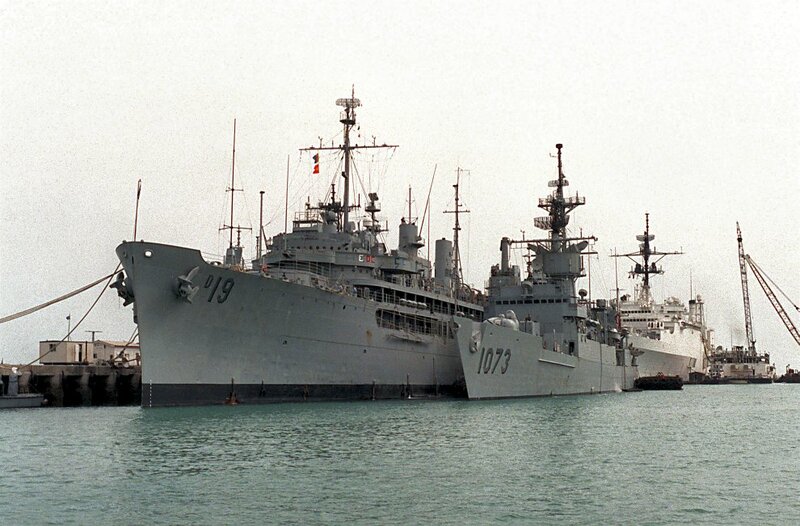 197k 01 June 1991: NavSta Pearl Harbor, Hi. 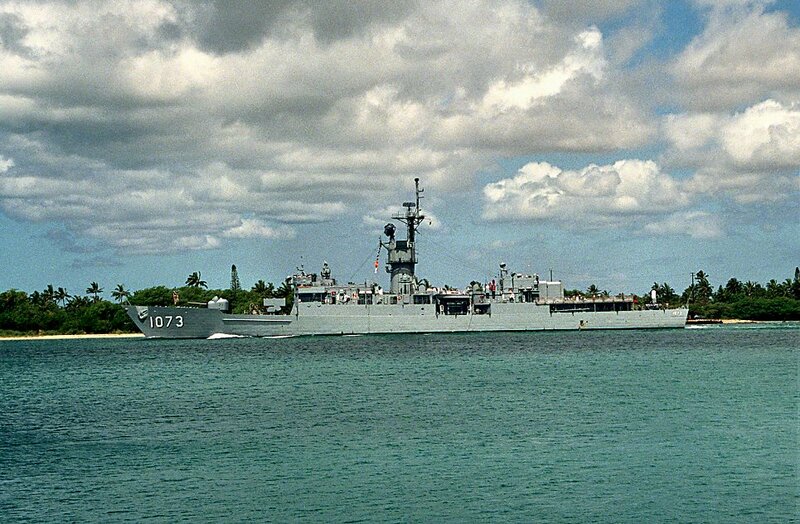 - A port view of Robert E. Peary departing Pearl Harbor through the channel as it heads out to sea after a visit to the naval station. 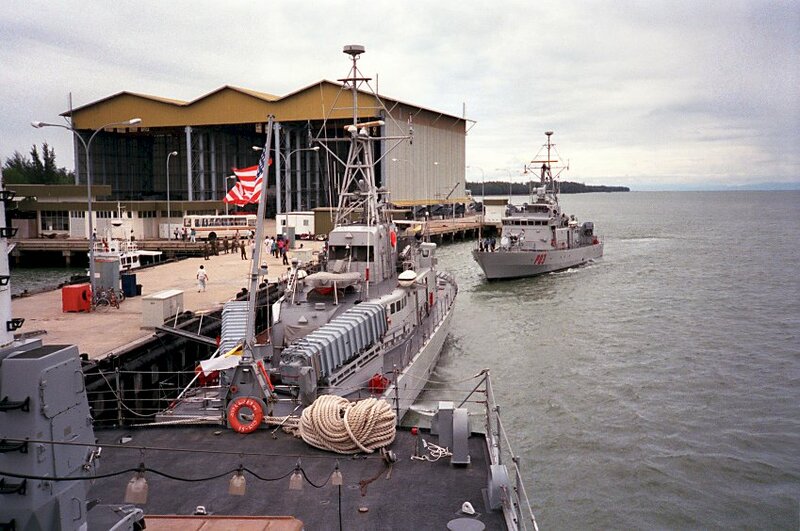 229k 01 June 1991: Pearl Harbor, Hi. 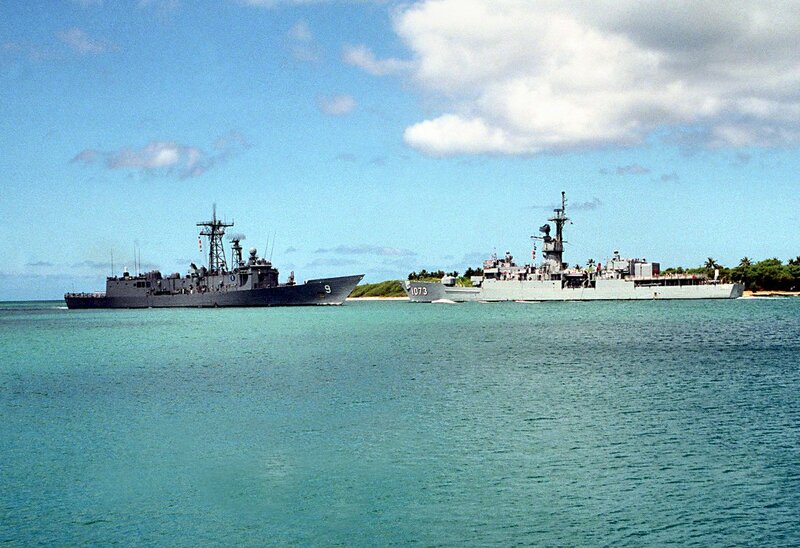 - The frigate Robert E. Peary, right, and the guided missile frigate USS Wadsworth (FFG 9) pass one another at the entrance to the channel as the Wadsworth arrives for a visit to Naval Station, Pearl Harbor, Hawaii. 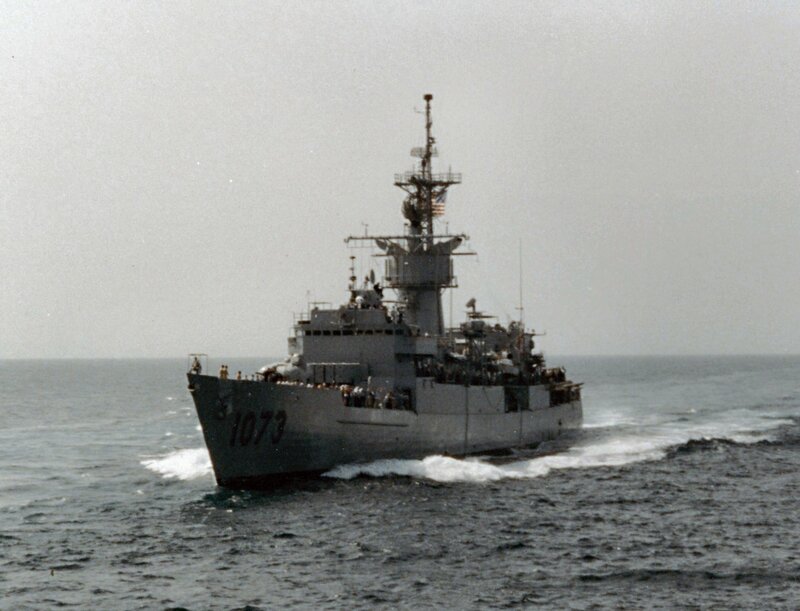 101k 27 November 1991: Naval Station Subic Bay, P.I. - A large harbor tug escorts Robert E. Peary toward port. 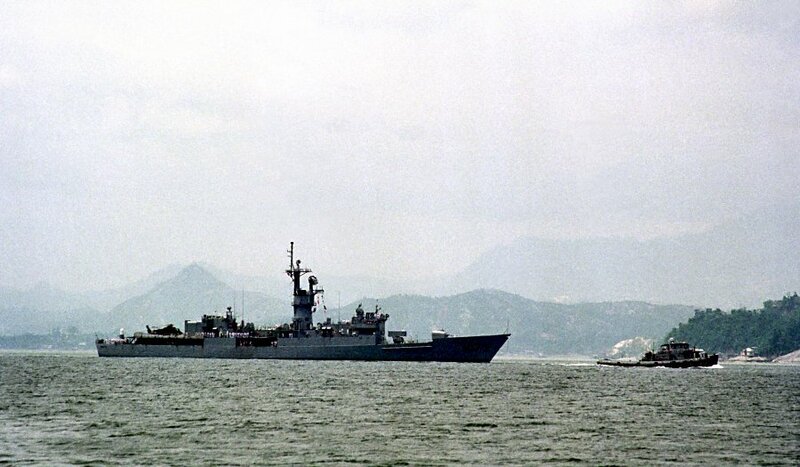 151k 01 December 1991: Naval Station Subic Bay - A port bow view of the destroyer tender USS Yosemite (AD 19), Robert E. Peary and the miscellaneous flagship USS LaSalle (AGF 3) docked in port. 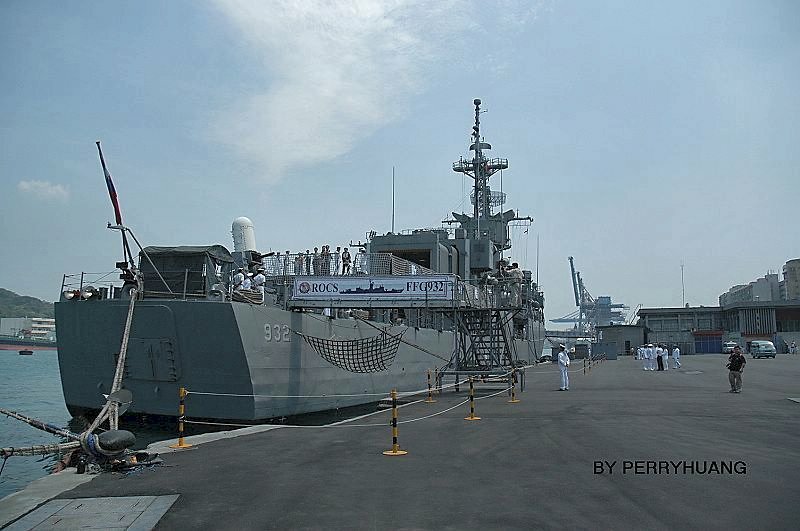 The vessel is in the region in support of maritime interdiction operations. 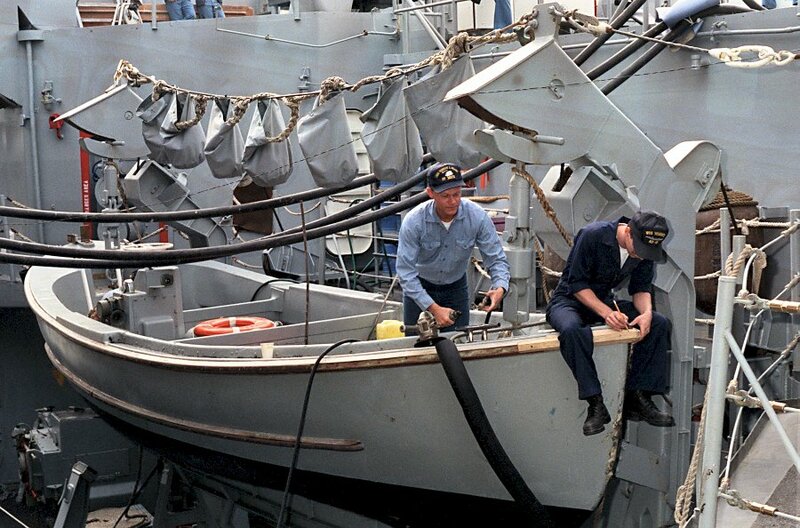 157k 13 December 1991: location unknown - Hull Technician 3rd Class Nicholas Oswald, seated on bow, and SN Bryan Rocke replace the beading on a 26-foot motor whaleboat from Robert E. Peary. 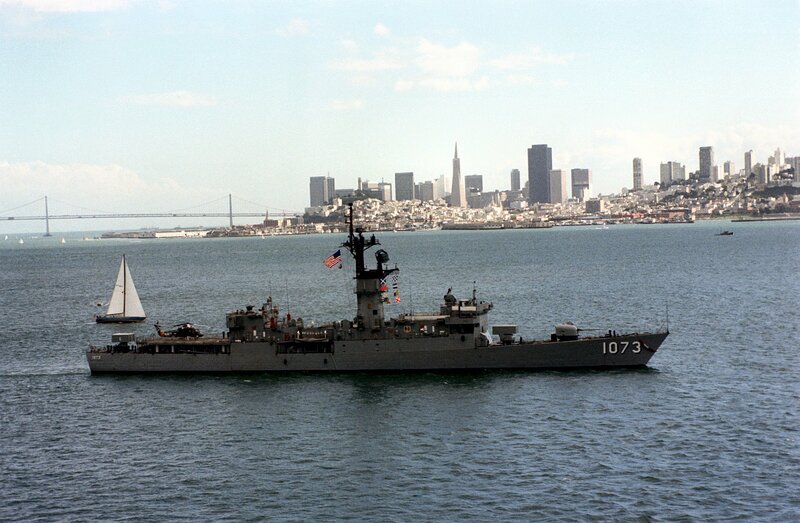 Oswald is a crew member aboard the destroyer tender USS Yosemite (AD 19) while Rocke is stationed aboard Robert E. Peary. 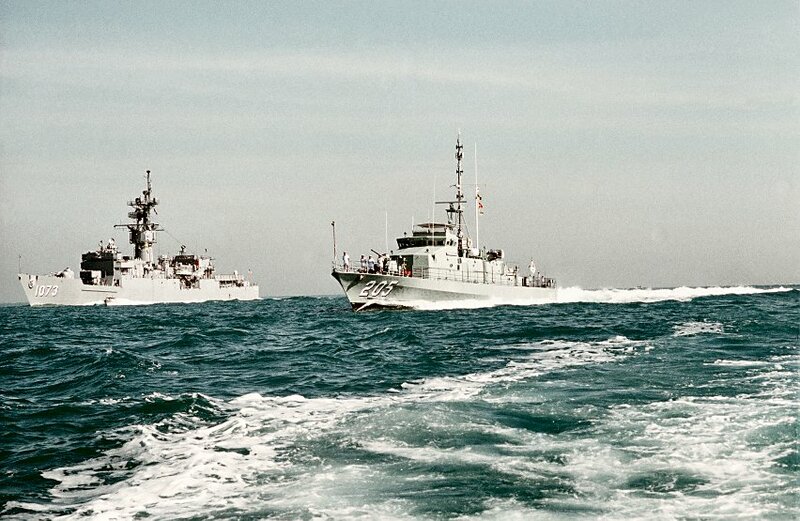 Both vessels are deployed to the gulf during maritime interdiction operations. 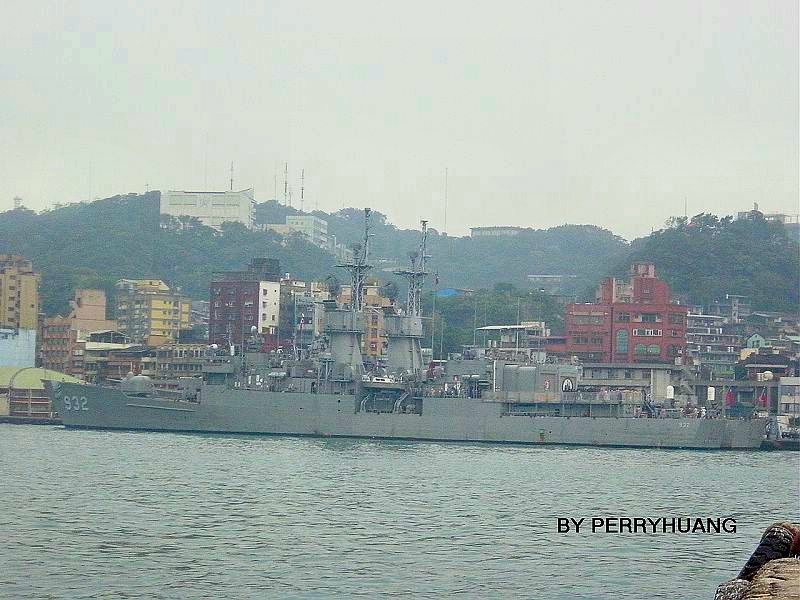 498k 26 May 2012: location unknown - The guided missile frigate ROCS Chih Yang (FF-932) (ex-USS Robert E. Peary, FF 1073) tied-up pierside. 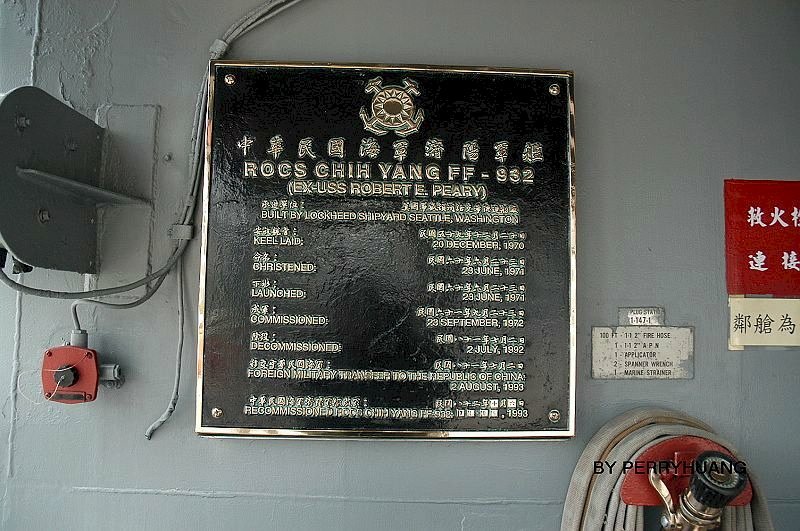 72k 19 October 2013: location unknown - The guided missile frigate ROCS Chih Yang (FF-932) (ex-USS Robert E. Peary, FF 1073) pierside. 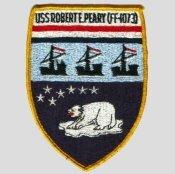 View the USS Robert E. Peary (DE 1073) DANFS history entry located on the Naval History and Heritage Command web site. 5.) 06 Jun. 1980 - 22 Jun. 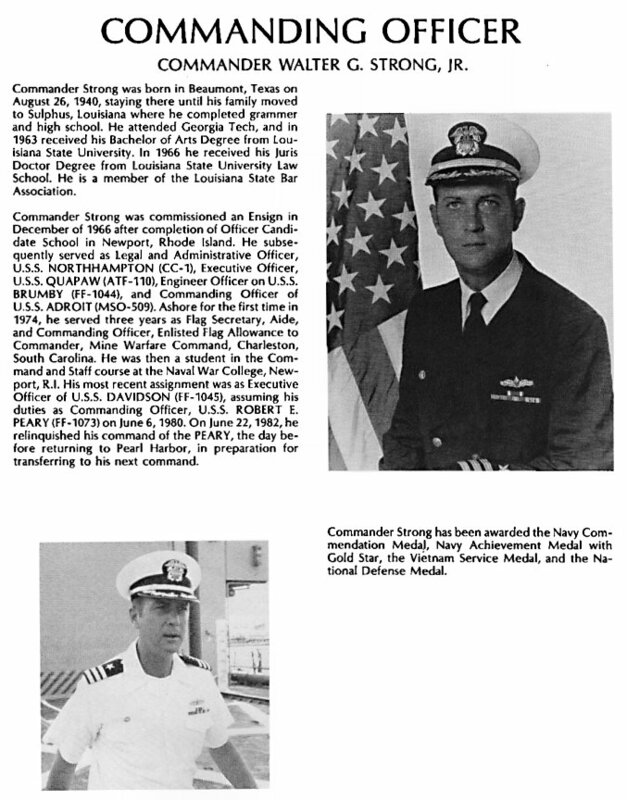 1982 Cmdr. Walter Garland Strong Jr. 6.) 21 Jun. 1982 - 12 Sep.1984 Cmdr. Paul Nicholas Bontrop Jr.
17 - 20 June 2016 at St. Louis, Mo.